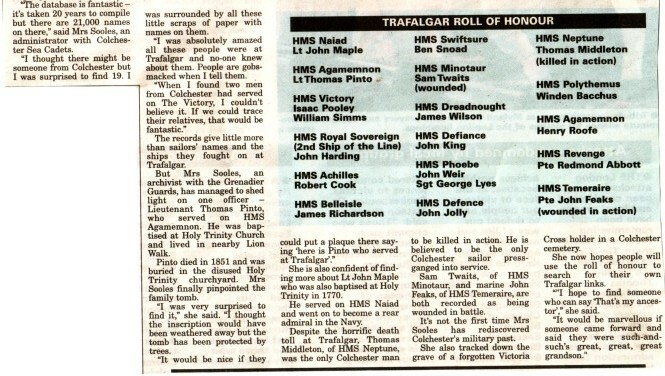 Here follows a list of the 21 Colchester men who are believed to have fought at the Battle of Trafalgar in 1805. These have been discovered and researched by Joan Soole in 2005 from records at the Public Record Office in Greenwich. was cleaned up in 2005. 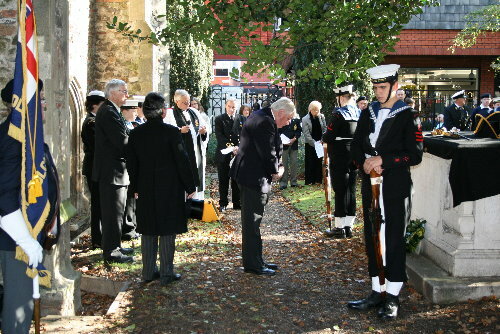 On October 21st 2006, a procession, including the Mayor of Colchester, Sea Cadets, the Town Watch and a standard bearer marched from the Town Hall to Trinity Church, with a service of commemoration to mark the Battle of Trafalgar and the part that our Colchester Heroes played at the Battle of Trafalgar. The following is what is known of the men and their ships. The first section tells what we know of the man, mostly taken from naval records. The second section tells of the ship he was serving on during the Battle of Trafalgar, mostly taken from Wikipedia. Isaac Pooley aged 23 born in Colchester, Essex, England. Comments: Run 28 June 1807 Portsmouth. He left the Royal Navy in 1816 and returned to Colchester where he lived at the Hythe as a bootmaker. He married Elizabeth Winch in 1825 at St Leonards Church, Colchester and they had eight children. In the 1871 census he was shown as being, 'deaf from noise of cannons'. He died in 1872 at the age of 87 years and was buried in Colchester' Cemetery on Mersea Road. 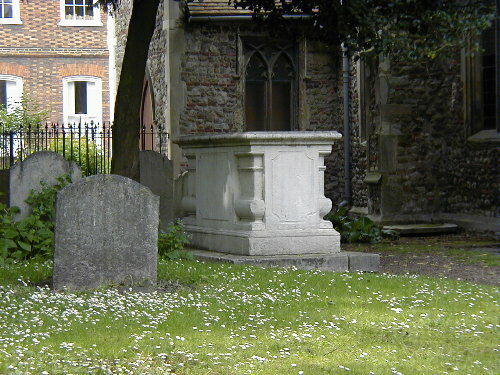 His gravestone was re-discovered in Colchester's cemetery and restored in 2007 and is shown here. Some of his known descendants now live in Australia. The gravestone makes no mention of Isaac's naval career, so the 1807 record stating 'run' possibly suggests that he did not quit the navy in best circumstances. In the 1841 census he was living in Parsons Lane, St Leonard parish with his wife Mary, aged 45. He was shown as being aged 55, a cordwinder. In the 1851 census he was living in Hythe Street, St Leonard parish with his 9 year old son, Isaac B(erry) Pooley. He was shown as being a widower aged 65, born in Colchester. In the 1861 census he was living in Hythe Street with his 25 year old daughter Elizabeth, a school mistress. He was shown as a widower, aged 76 years, a retired shoemaker and Greenwich pensioner. In the 1871 census he was living in Park Lane (later New Park Street and between Victor Road and Port Lane) with his 35 year old daughter Elizabeth, an annuitant. He was shown as a widower, aged 86 years, a pensioner, deaf from the noise of cannon. In November 1797 an Isaac Pooley married Susannah Thompson in St Leonards Church in Colchester. What connection could there be with this mnarriage we wonder? A descendant of Isaac Pooley has been inspired to do some research into Isaac's life. This is what he told Joan Soole in an email. 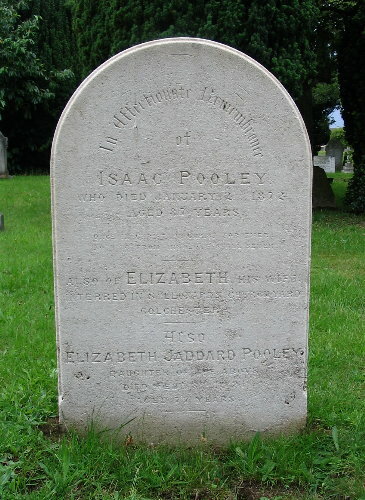 Isaac Pooley (1) was left 2 houses by his cousin Isaac Pooley (2) who was also a shoemaker in Colchester. Isaac Pooley (2) also left in his will items to his wife Mary Marriage, which I obtained a copy of. On Isaac Pooley (2)s wedding certificate to Mary Marriage, it states that his father is Isaac Pooley (3) who is a sailor. I have spent a lot of time down at Kew National Archives. Going through muster rolls, I find a lot of references to an older Isaac Pooley who was a gunner in the Royal Navy and was 36 in 1799. I am certain this is Isaac Pooley (3) . This Isaac Pooley (3) pay book also states that he has a wife called Susan. I cannot find any reference to an Isaac Pooley at the battle of the Nile and I have been through every muster roll of every ship that was there. (The only reference I can find to that is newspaper clippings at the time of his death, but I am wondering of that has become distorted in time.) However, I do know that Isaac Pooley (1) served in the battle of Martinique in 30th Jan to 24th Feb1809 whilst aboard Acasta and the Invasion of Java Aug to Sep 1811 whilst on board the Scipion. Isaac Pooley (1) and (3) were both on board HMS Blonde albeit for a very very short time as Isaac Pooley (1) was taken away to HMS Kent by order of Sir Richard Bickerton , Baronet (attached a snip of that from HMS Blonde). I still have a lot of research to do at Kew as I am plotting Isaac Pooley (1)s movement around (so far, he has been to Malta, Barbados and all down the West coast of France and Spain). I am also going to go further back on Isaac Pooley (3) and see his movements as i find this thoroughly interesting. HMS Victory is a 104-gun ship of the line of the Royal Navy, built between 1759 and 1765. She is the oldest naval ship still in commission and the only remaining ship of the line except for the Regalskeppet Vasa. She sits in dry dock in Portsmouth as a museum ship. In December 1758, the commissioner of Chatham Dockyard was instructed to prepare a dry dock for the construction of a new 106-gun first-rate ship. This was an unusual occurrence at the time; during the whole of the 18th century only ten were constructedthe Royal Navy preferred smaller and more manoeuvrable ships and it was unusual for more than two to be in commission simultaneously. The keel was laid on 23 July 1759 in the Old Single Dock (since renamed No. 2 Dock and now Victory Dock), and the name was finally chosen in October 1760. It was to commemorate the Annus Mirabilis or Year of Victories, of 1759. In that year of the Seven Years' War, land victories had been won at Quebec, Minden and naval battles had been won at Lagos and Quiberon Bay. There were some doubts whether this was a suitable name since the previous first-rate Victory had been lost with all on board in 1744. Because there was no immediate use for her she was placed in ordinary in reserve having been roofed over, demasted and placed under general maintenancemoored in the River Medway for 13 years until France joined the American War of Independence. She was commissioned in 1778 under the command of Rear Admiral John Campbell (1st Captain) and Captain Jonathan Faulknor (2nd Captain), with the flag of Admiral the Honorable Augustus Keppel. She was armed with smooth bore, cast iron cannon 30 x 32 and 42 pounders (15 and 19 kg), 30 x 24 pounders (11 kg), and 40 x 12 pounders (5 kg). Later she also carried two carronade guns, firing 68 lb (31 kg) round shot. William Simms aged 23 born in Colchester, Essex, England. Comments: Run 12 Aug 1809 not returned from leave. John Harding aged 38 born in Colchester, Essex, England. HMS Royal Sovereign (1786) was a 100-gun 1st rate ship of the line which served as the flagship of Admiral Collingwood at the Battle of Trafalgar. She was the third of seven Royal Navy ships to bear this name. Designed by Sir John Williams, she was launched at Plymouth Dockyard September 11, 1786, at a cost of £67,458. She was of 2193 tons burthen, with gundeck length 186' 0" and breadth 52' 0". She mounted 100 great guns on her 3 full gundecks, quarterdeck, and forecastle. On June 16, 1795, as the flagship of Vice-Admiral William Cornwallis, she was involved in the celebrated episode known as "Cornwallis' Retreat". The first ship of the fleet in action at Trafalgar on October 21, 1805, she led one column of warships; Nelson's Victory led the other. Due to the re-coppering of her hull prior to her arrival off Cadiz Royal Sovereign was a considerably better sailer, in the light winds present that day, than other vessels, and pulled well ahead of the rest of the fleet. As she cut the enemy line alone and engaged the Spanish flagship Santa Ana, Nelson pointed to her and said, "See how that noble fellow Collingwood carries his ship into action!" At approximately the same moment, Collingwood remarked to his captain, "What would Nelson give to be here?" Although pounded nearly to a wreck by the Spanish fleet, she forced Santa Ana to surrender and was herself rescued by the arrival of the rest of her column. After her useful active life she was converted to harbour service as a receiving ship at Plymouth before being renamed Captain on August 17, 1825. Becoming a hulk in June, 1826, this Royal Sovereign was finally broken up at Plymouth, completed August 28, 1841. Four of her guns were saved and are incorporated in the Collingwood Memorial in Tynemouth. Robert Cook aged 22 born in Colchester, Essex, England. Died 17 June 1810, drowned in Cadiz harbour out of pinnance when returning from watering. HMS Achille was a 74-gun third-rate ship of the line of the Royal Navy. She was built by Cleverley Bros., a private shipyard at Gravesend, and launched in 1798. Her design was based on the lines of the captured French ship, the Pompee. She was the fourth Royal Navy ship to be named after the Greek hero Achilles in the French style. On 21 October 1805, under the command of Captain Richard King, Achille was in Admiral Collingwood's column at the Battle of Trafalgar, seventh in the line, between Bellerophon and Polyphemus. Achille opened fire on the rear of the French and Spanish fleet at 12.15, engaging the Montanes, 74, for fifteen minutes, before sailing on to meet the Argontauta, 80, which had already been battling with other British ships. After hours of fierce fighting, Argonauta fell silent and closed her gunports, but before Achille could accept her surrender, her French namesake Achille, 74, moved in to engage the British ship. After exchanging broadsides, the French ship sailed on and was replaced on the starboard side by the Berwick, 74, and for the next hour and a quarter she lay close alongside Achille, receiving a pounding that eventually forced her to surrender with over 250 casualties - almost half her crew. Achille took possession, and transferred some of her crew back on board as prisoners. Achille suffered 13 killed and 59 wounded in the battle, in stark comparison to the heavy losses she inflicted on her French and Spanish adversaries. She continued in active service until 1815, when she was decommissioned at Chatham, and laid up at Sheerness. She survived in this state until 1865, when she was sold for £3,600 to be broken up. James Richardson aged 27 born in Colchester, Essex, England. There is a strong possibility that James Richardson died on 30 November 1868, aged 88, (death registered in Lambeth. Having deserted HMS Courageux, he is believed to have worked as a warehouseman and married Ann (Nancy) Watts in 1810. Together they had nine children. Jemimah Thirza Richardson (born 7 September 1811, Peckham, London, England; married Benjamin Hawkins on 23 September 1847 at St Mark's Church, Kennington; died 16 January 1903. James Richardson (born 2 Sept 1813). Ann Richardson (born 31 March 1815, Lambeth, London, England; died 14 June 1880). Jane Richardson (born 19 May 1817; died 7 February 1891). Elizabeth (Betsy) Richardson (born 12 December 1819; married R Higgins; died 1874). Mary Ann Richardson (born 4 Jan 1821, Westminster, London, England; married Samuel Hawkins). James Richardson (born 1 August 1823; died March 1826). Solomon Richardson (born 1 August 1823). Thomas Edward Richardson (born 8 December 1824; died 14 May 1889). Comments: From HMS Zealand, volunteer. Comments: Lent to HMS Leda 1-12 December 1800. Comments: James Richardson deserted HMS Courageux on 9 January 1810 at Deal. HMS Belleisle was a 74-gun third rate ship of the line of the Royal Navy. She was built at Rochefort for the French Navy, and initially named Lion. She was later renamed Marat, and then Formidable, with the changing fortunes of the French Revolution. She was captured on 23 June 1795 at the Battle of Groix, near the French port of Lorient. She was taken into service in the Royal Navy, but because the Navy already had a Formidable, she was renamed Belleisle, apparently in the mistaken belief that she had been captured off Belle Île, rather than the Île de Groix. Captained by William Hargood, she was the first ship in the British lee column at the Battle of Trafalgar in 1805, and as such was engaged by the French ships Achille, Aigle, Neptune and Fougueux. She was soon completely dismasted (the only British ship which suffered that fate), unable to manuvre and largely unable to fight, as her sails blinded her batteries, but kept flying her flag for 45 minutes until the British ships behind her in the column came to her rescue. With 33 dead and 93 wounded, she was then towed to Gibraltar after the battle by the frigate HMS Naiad. From 1811 she was in Portsmouth harbour, and in 1814 the decision was taken to have her broken up. Ben Snood served for two years in the Royal Navy. He was born in 1777 and died in Wivenhoe in 1837 at the age of 60 years. What is believed to be his (and his wife Elizabeth's) gravestone was re-discovered by Ben's great great great great grandson, Brian Rose, at St Mary the Virgin Church in Wivenhoe. 'Ben Snood' was in fact Benjamin Clover SNOOD. He was born 23rd December 1777 & baptised 11th Jan 1778 at St Mary the Virgin, Wivenhoe, the son of William SNOOD, a Master Mariner & Boat Builder of Wivenhoe, and Ruth nee Clover. It is believed that he was in the Royal Navy for a lot longer than the 2 years as stated in the papers. He was aboard the ship 'Calcutta' in 1804 - until 16th Sept 1805. 3rd Aug 1805 sailed from St Helena with a convoy. 25th Sept sighted the Rochefort squadron. 26th Sept captured by the Rochefort squadron. Benjamin Snood was aboard the Swiftsure at the Battle of Trafalgar & his pay book number was SB 162. 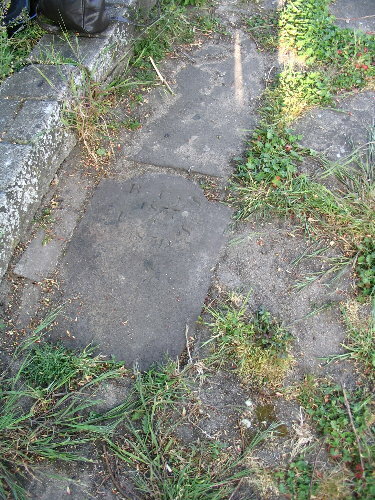 The above picture is of Ben and Elizabeth's gravestone (May 2007), simply laid down in an unkempt area of the church grounds. A fitting tribute to a Trafalgar hero? Launched in 1804 at Bucklers Hard. Was a 74-gun 3rd rate ship of the line which fought at Trafalgar. It was a myth at the time that the Swiftsure sailed faster at night. She was sold in 1845. The French ship Swiftsure also took part in the battle. She was Initially HMS Swiftsure, she was a 74-gun ship of the line of the Royal Navy, built at Deptford in 1787 under plans by engineer Wells. She was captured by the French ships Indivisible and Dix-Août in the Mediterranean on the 24 June 1801. She fought on the French side at the Battle of Trafalgar, where she was re-captured by the British, on the 21 October 1805. She was recommissioned in the Royal Navy as HMS Irresistible, since another British Swiftsure had been built since, and was used as a prison ship. She was scrapped in Chatham in 1816. Samuel Twaits? aged 37 born in Colchester, Essex, England. HMS Minotaur was a 74-gun third-rate ship of the line launched in 1793 named for the mythological bull-headed monster of Crete. The ship fought at the Battle of the Nile in 1798, engaging the Aquilon with HMS Theseus and forcing her surrender, an operation which cost Minotaur 23 sailors dead and 64 wounded. She was present at the landings in Aboukir Bay during the invasion of Egypt in 1801 where she lost four men, and was finally present at the Battle of Trafalgar under Captain Charles John Moore Mansfield, where she was instrumental in capturing the Spanish ship Neptuno. During her career, she also managed to capture the French frigate Franchise, as well as attack shipping outside Genoa, Algeciras and Fredricksham in Russia. Whilst sailing from Gothenburg to Britain, she struck the Haak Bank on the Texel off the Netherlands in the evening of 22 December 1810, after becoming separated from her consorts, HMS Plantagentet and HMS Loire. She rolled on her side rapidly, where waves dismasted her and pounded her hull which began to split. Prior to the roll, 110 of her crew had taken to her boats and soon reached shore, where they informed the Dutch authorities of the disaster. The authorities however placed the survivors under custody and refused to dispatch any rescue vessels until the following morning. The rescue party found however that apart from four men who reached shore by clinging to wreckage, no survivors remained on the vessel or in the surrounding water, with the death toll being between 370 and 500. Three and a half years later, when the prisoners were released, the customary court martial decided that the deceased pilots were to blame for steering the ship into an unsafe position, having misjudged their location by over 60 miles because of the weather. The Dutch authorities were highly criticised for their failure to despatch rescue boats sooner. James Wilson aged 21 born in Colchester, Essex, England. HMS Dreadnought was a 98 gun second-rate ship of the line of the Royal Navy. She was launched at Portsmouth at midday on Saturday, 13 May 1801, after 13 years on the stocks. She was the first man of war launched since the Act of Union 1800 created the United Kingdom of Great Britain and Ireland, and at her head displayed a lion couchant on a scroll bearing the Royal arms as emblazoned on the Standard. The launching was a spectacle; it was reported that at least 10,000 people witnessed Commissioner Sir Charles Saxton break a bottle of wine over her stem, and that after the launch Sir Charles gave a most sumptuous cold collation to the nobility and officers of distinction. After the launch, Dreadnought was brought into dock for coppering, and a great number of people went on board to view her. The following day, due to the exertions of Mr Peake, the builder, and the artificers of the dockyard, she was completely coppered in six hours and on Monday morning she went out of dock for rigging and fitting. Her first commander was Captain James Vashon. After cruising for some time in the Channel he proceeded off Cádiz and Minorca where he continued until the summer of 1802. Her first master was Mr. Banks followed by Joseph Foss Dessiou (17691853), who was paid off on 15 July 1802. In 1803, Captain Edward Brace briefly took command as Flag-Captain to William Cornwallis, until he was relieved that same year by Captain John Child Purvis. Purvis served under the orders of Admiral Cornwallis until he was promoted to Rear Admiral in April 1804. The next commander until August was Robert Carthen Reynolds. He was superseded that month by George Reynolds, who, in turn, was replaced in December that year by Edward Rotheram, who stayed as flag captain to Admiral Cuthbert Collingwood until just before Trafalgar. The winter gale weather off the French coast badly damaged five of the major warships maintaining the blockade. Dreadnought lost most of her powder when water poured into the magazine. In the spring of 1805, Admiral Cornwallis was replaced by an ailing Lord Gardner who allowed the close blockade to be slackened. On 30 March the French fleet escaped from Toulon and reached Cádiz on 9 April. The French and Spanish squadrons sailed separately from there and joined forces in Martinique on 26 May. On 15 May Collingwood and his squadron of seven ships received orders from the Admiralty to sail for Barbados. Before they could depart; however, Horatio Nelson arrived from the Mediterranean Sea in pursuit of the French, and Dreadnought proceeded to Cádiz for Collingwood to command a close blockade there. Early in October 1805 Captain John Conn assumed command of Dreadnought, after having brought Royal Sovereign out from England for Vice Admiral Collingwood. Collingwood and Rotheram then moved to the newly recoppered first rate on the 10th of October 1805, leaving Conn in command of the now sluggish Dreadnought, with her barnacled hull badly in need of careening, but nevertheless with a well exercised ship's company, who for months having been under Collingwoods watchful eye, now contained the most efficient gun crews in the fleet. At the Battle of Trafalgar on 21 October 1805, Dreadnought was the eighth ship in the lee division to enter the action. She started firing on San Juan Nepomuceno at two o'clock and fifteen minutes later ran her on board and forced her to surrender after her valiant Spanish commander Commodore Cosme Damian de Churruca y Elorza had been killed in action. She then attempted to engage Principe de Asturias but the Spanish ship hauled off. During the battle Dreadnought lost seven killed and 26 wounded. Dreadnought continued to patrol the Channel and the Baltic for another seven years, until 1812, when she was taken out of commission at Portsmouth. In 1827, she became a lazaretto (quarantine ship) at Milford on Sea and became the second of the ships used by the Seamen's Hospital Society, between 1831 to 1857, as a hospital ship for ex-members of the Merchant navy or fishing fleet, and their dependants. HMS Dreadnought was broken up in 1857 with the infirmary transferring to the Caledonia, which was renamed Dreadnought. In 1870 the infirmary transferred onto land as the Seamen's Dreadnought Hospital at the Royal Greenwich Hospital, and since 1986 as the 'Dreadnought Unit' at St Thomas's Hospital. In addition, the Seamen's Dreadnought Hospital provided in 1919 the foundation for the UK's dedicated Hospital for Tropical Diseases. John King aged 24 born in Colchester, Essex, England. HMS Defiance was a 74 gun third-rate ship of the line of the Royal Navy, built in 1783 by Randall and Co., at Rotherhithe on the River Thames. Her crew mutinied three times, in October 1795 (then commanded by Captain Sir George Horne). HMS Calcutta, Captain William Bligh commanding, was ordered to embark 200 troops and take them alongside in order for the troops to board Defiance and regain control. The threat of the soldiers ended the mutiny. Defiance also mutinied in 1797  and 1798 . She fought at the Battle of Copenhagen on April 2, 1801, as the flagship of Rear Admiral Sir Thomas Graves, and commanded by Captain Richard Retalick. She also participated in the Battle of Cape Finisterre on July 22, 1805, and the Battle of Trafalgar on October 21, whilst under the command of Captain Philip Charles Durham, who claimed that 'she was the fastest 74 gun ship in the British fleet'. In the latter battle she captured the Spanish San Juan Nepomuceno and sustained casualties of 17 killed, 53 wounded. After serving as a prison ship at Chatham from 1813, she was broken up in 1817. John Jolly aged 20 born in Colchester, , Essex, England. The Defence, commanded by Captain George Hope, took part in the battle of Trafalgar. The Defence, as fourteenth ship of the lee column, was very late in getting into action. She first engaged the French Berwick and then attacked the Spanish San Ildefonso, 148; which struck after an hour's action. The Defence lost 7 killed and 29 wounded. On December 24th, 1811, after some minor services in the Baltic, the Defence, commanded by Captain David Atkins, was wrecked and lost on the coast of Jutland, 593 men being lost out of 597. Thomas Middleton aged 60 born in Colchester, Essex, England. HMS Neptune (1797 at Deptford) was a 98-gun 2nd rate ship of the line which fought at the Battle of Trafalgar. Commanded by Captain Thomas Fremantle, she played an important role in the battle, stationed third in the weather line, behind the flagship Victory and the Temeraire. After the battle, it was the Neptune that towed the crippled Victory, bearing Nelson's body, back to Gibraltar. Combatants at Trafalgar also included the French ship Neptune and the Spanish ship Neptuno. Neptune served as the flagship for Rear Admiral Sir Alexander Cochrane leading the fleet that captured the French colony of Martinique in the West Indies in 1809. She was the second of nine ships to bear the name Neptune. She was laid up in ordinary in 1810 and broken up 1818. Bacchus Winden aged 46 born in Colchester, Essex, England. HMS Polyphemus, 64, a third-rate ship of the line, was the first ship of the Royal Navy named for Polyphemus the Cyclops. She was laid down and Sheerness in 1782 and was commissioned in 1799 under the command of Captain G. Lumsdaine. She sailed from Yarmouth on 9 August 1800 with a squadron under Vice Admiral Dickson in Monarch bound for Denmark. Because of lack of wind the faster sailing vessels had to tow the slower ones and it was 15 August before they reached the Skaw. The next day the whole squadron advanced as far as the mouth of the Sound where the Danes had anchored three 74-gun ships, later increased to four, between Cronberg Castle and the Swedish shore. Because of gales the Admiral sheltered his squadron in Elsinor Roads then went in Romney as far as Sophienburg to talk with Lord Whitworth who was negotiating with the Danish ministers. When matters were resolved the squadron returned to Yarmouth in September. In 1805, Captain Robert Redmill took command of Polyphemus off Cadiz. Later that year, she took part in the Battle of Trafalgar. In July 1806 she was with Lord St. Vincent's squadron off Ushant and on 14 July her boats, together with others of the squadron, were taken by the Iris to Sir Samuel Hood in Indefatigable off Rochefort to attack two French corvettes and a convoy at the entrance to the Garonne. The weather on 15 July appeared suitable for the attempt but after the boats left a strong wind blew up and although they managed to capture the 18-gun brig Caesar they could not prevent the convoy escaping up river. The greater part of the boats were either shot through or so badly stove in that they were swamped, and had to be cut adrift from the brig as she was brought out under fire from the batteries and ex-British Teaser brig. The casualties from Polyphemus were William Anderson, Quarter Master's Mate, who was cut across the hand, and W. Fleming, Coxswain, who was cut across the eyebrow. In 1807 Polyphemus, under the command of Captain P. Heywood, became the flagship of Rear Admiral Murray, South America. In 1808, under the command of Captain W. Price Cumby (another Trafalgar veteran), she became the flagship of Vice Admiral B.S. Rowley. In July she sailed for Jamaica, convoying a large fleet of merchantmen, for the Vice Admiral to take up his appointment. Since he resided on shore with his flag in Shark, Polyphemus was able to undertake cruises against the enemy. On the morning of 14 November he detached his boats under Lieutenant Joseph Daly in the barge to chase a schooner attempting to enter the harbour at San Domingo. An hour later she was boarded and carried under a hail of grape and musketry in which marine Samuel Crompton was killed and proved to be the French national schooner Colibry of three carriage guns commanded by Lieutenant Deyrisse with 63 men. In June 1809 Captain Cumby was appointed to command a squadron consisting of Polyphemus, Aurora, Tweed, Sparrow, Thrush, Griffin, Lark, Moselle, Fleur-de-Mer and Pike. They sailed from Port Royal on 7 June with troops under Major General Carmichael to assist the Spanish forces besieging the French in the city of San Domingo. On 1 July Polyphemus anchored at Caleta and loaded eight of her lower deck guns into the Sparrow sloop to be landed at Palenqui for the use of the batteries to the westward of the town. Two of the guns were then transported by Captain Burt of Sparrow from Andre Bay to the east battery, nearly 30 miles across almost impassable country. The French garrison surrendered on 6 July. Captain Cumby was appointed to Hyperion in March 1811 and was succeeded by Captain T. Graves then Captain Douglas. Polyphemus paid off at Chatham in November 1812. Henry Roofe aged 21 born in Colchester, Essex, England. John Wales aged 20 born in Colchester, Essex, England. HMS Ajax, launched in 1798, was a 74-gun third-rate ship of the line of the Royal Navy. She fought at the Battle of Trafalgar in 1805. During the battle she assisted Orion in forcing the surrender of the French seventy-four Intrépide. BAP. HOLY TRINITY, COL. 2.1.1770, BECAME REAR ADMIRAL. J F Maples C.B. entered the service in 1782 as a captain's servant.. Master's mate in 1789, lieutenant in 1794, First lieutenant at Trafalgar. Commander 1810, C.B. 1815, retired Rear Admiral 1846, died 1847 Kilburn. Other information known. HMS Naiad was built by Hall and Co. at Limehouse on the Thames, launched in 1797 and commissioned in 1798. On 15 October 1799 Naiad sighted two Spanish frigates, the Santa Brigada and Thetis, which were returning from Mexico to Spain with gold worth £600,000. She gave chase with two other British frigates, HMS Ethalian and HMS Almene. Ethalian caught and captured the Thetis, whilst Naiad and Almene captured the Santa Brigada. In 1805 Naiad was part of the squadron of frigates that watched the French and Spanish fleets in Cadiz prior to the Battle of Trafalgar. Too small to take part in the battle itself, she lay winward of the action. After the battle she towed HMS Belleisle to Gibraltar. Served in many other actions in the Napoleonic Wars, and was finally paid off in 1826. Naiad was sent to serve as a depot ship, first to Valparaiso, Chile in 1846 and then to Callao, Peru from 1851 and 1898. Broken up in 1898 Naiad was the longest survivor of any of the British ships at Trafalgar apart from HMS Victory. Born in Colsterworth, BAPTISED, ALL SAINTS, COLCHESTER. 4th Feb 1774 the son of Thomas and Mary Pinto, joined the ship aged 31 on 6th Jan 1805, promoted to lieutenant in 1805, DIED NOV. 1851, BURIED AT HOLY TRINITY, PCC will PROB 11/2146 proved 23rd Jan 1852 described as of Colchester and Captain RN. Other info known of medals, prizemoney, etc. His grave stone was restored in 2005 although, sadly, as a result of the cleaning, the inscription is barely legible now. From a book of monumental inscription transcriptions, held in the Colchester Library, and from the 1841 and 1851 censuses, we are able to confirm the following information. This contradicts the above record in that the gravestone states that he was born in Colsterworth (Lincolnshire) but that the 1851 census says he was born in Cambridge. So, what are we led to believe? The 1841 census shows Thomas and his wife Catherine living in Lion Walk. He was aged 69, with a profession of 'Royal Navy' and she is aged 53. Three Noone children and one servant were living with them. By 1851 he is shown again in Lion Walk, living with Catherine and his Noone niece and nephew. He is aged 78, a Captain R.N. on half pay, born in Cambridge. Catherine is shown as having been deaf and as being born in Colchester. Thomas' niece, Lucinda Noone, was recorded as an orphan. Each year, Colchester remembers those men of Colchester who fought at the Battle of Trafalgar. The following picture shows the Worshipful the Mayor of the Borough of Colchester, Councillor Ray Gamble, laying a wreath at Captain Pinto's tomb, accompanied by Colchester's Sea Cadets, the vicar of Old Heath, Bob Russell, MP for Colchester, and other personages. This was commemorated on Saturday 20th October 2007. The Agamemnon was a 3rd rate ship of the line,one of seven ships built to the same design, drawn by the same naval architect that designed the famous Victory, Sir Thomas Slade. Agamemnon was the third to be built in the class, the first two being Ardent in 1762 and Raisonnable, laid down in 1763. Third was Agamemnon, followed by Belliqueux in 1778, Stately in 1779, Indefatigable in 1781 and finally the Nassau in 1783. Twenty-six, twenty-four pounder - Gun deck. Twenty-six, eighteen pounder - Upper deck. Twelve, nine pounder - Quarterdeck. Complement - 491 officers and ratings. A Third Rate ship of the line like Agamemnon was an expensive warship to build. The construction of the ships hull with yards and masts fitted cost the Admiralty £20,579 (in todays terms, approximately £12 million), a figure that did not include ordnance, sails, hemp, copper plating and other hardware. For three of the most crucial decades in British naval history, Agamemnon always seemed to be at the centre of the action, having no less than eleven battle honours. Agamemnons maiden voyage was on 9th July 1781 under the command of Captain Caldwell. Her first engagement was at the battle of Ushant on 12th December 1781 where the British fleet under Rear Admiral Kempenfelt defeated the French fleet and captured a significant number of ships, including the convoy the French were escorting. Agamemnons next major engagement was at the Battle of The Saints on 12th April 1782 where Rodney and Lord Hoods fleet defeated Comte de Grasses French fleet. On 7th January 1793, Nelson learned from Lord Hood that he had been chosen to command his first ship of the line, the Agamemnon. Although initially disappointed that he had not been given command of a 74, Nelson soon grew fond of Agamemnon. Nelson wrote to his wife, Fanny. She was, he said, "Without exception one of the finest ships in the fleet, with the character of sailing most remarkably well". He also wrote after twelve days in a storm in the Mediterranean in "Gales and lumping seas but in Agamemnon we mind them not; she is the finest ship I ever sailed in, and were she a 74, nothing should induce me to leave her while the war lasts". Even a French Commander Admiral Alemand expressed the view that Agamemnon was one of the fastest ships in the British Navy. That, coupled with Nelsons inspirational command made her a very potent fighting unit. Nelson commanded Agamemnon, or "eggs and bacon" as her crew affectionately called her, until 10th June 1796. In that time Nelson had proved to be a great Commander, tactically and physically. It was during his command of Agamemnon that Nelson lost the sight of his right eye. When at the Siege of Calvi in 1794 during the morning of 10th July, Nelson was hit in the face and chest by splinters, stones and sand that were thrown up by an enemy shell that hit a battlement during a shore action. On 13th June 1796, Nelsons broad pennant was transferred to the 74 gun Captain at anchor in San-Fiorenza bay. He watched the worn out Agamemnon sail to England for a much-needed refit. She was refitted from the bottom up at Chatham. When re-commissioned in 1797 she was ordered to join Admiral Duncans squadron off Yarmouth, which was keeping watch on the coast of Holland. She was immediately caught up in the naval mutinies of that year. Agamemnon was however considered untrustworthy by Richard Parker the leader of the Nore mutineers and had the guns of the mutinous ships trained on her to ensure she did not blackleg. Subsequently in the proceedings that followed all thirteen of Agamemnons crew who were tried were pardoned. Agamemnons next major fleet engagement was the battle of Copenhagen on the 21st April 1801. Unfortunately she was grounded on a shoal for most of the action, but Nelson won the battle and a truce with Denmark was negotiated. On the 21st October 1805 Agamemnon took part in the battle of Trafalgar. When Nelsons favorite ship hove in sight a week before, with Nelsons old friend Sir Edward Berry in command of the Agamemnon, Nelson was delighted "Here comes that damned fool Berry! Now we shall have a battle." Later in Agamemnons career, she served in the West Indies, taking part in the battle of Santo Domingo, and then in South American waters. Agamemnon was wrecked in Maldonado Bay off the coast of Uruguay on the 16th June 1809. Divers discovered the remains of HMS Agamemnon on the bottom of Maldonado Bay, after a six-year search by marine archaeologists. Strewn around the site are hundreds of copper plate, as well as a 24 pounder cannon, parts of the pumping devices as well as a significant amount of shot, bolts and copper nails. Also discovered was a silver pocket seal, complete with fob chain. On its face of translucent stone it bore a star shaped emblem with the name Nelson in mirror image incised in a curve above. Born in Colchester, MARRIED 1st February 1800, ST MARY MAGDALEN, COLCHESTER, to Ann Williams, spinster, enlisted 9th May 1800 with the trade of labourer, joined the ship 8th May 1805 aged 24. Died 1st Nov 1811 on the Argonaut Hospital Ship. He had dark brown hair, a fair complexion, grey eyes and was 5' 8"
HMS Revenge, launched in 1805, was a third-rate of 74 guns. Newly commissioned, and captained by Robert Moorsom, she fought at the Battle of Trafalgar. She sailed in Collingwood's column. Revenge served until 1842, being broken up in 1849. She was one of the first warships of the Royal Navy to be painted with the Nelson Checker. HMS Temeraire was a 98-gun second-rate ship of the line of the Royal Navy, launched in 1798 at Chatham, which fought at the Battle of Trafalgar. She was named after the French 74-gun ship taken at the Battle of Lagos (1759), following the British custom of naming new ships after old prizes. At Trafalgar under the command of Eliab Harvey, she was next astern to Victory, Temeraire was badly damaged as she fought to relieve Nelson's flagship. During the battle, Temeraire helped force the surrender of the French ship Redoutable and captured the French ship Fougueux. She became famous as the subject of two paintings by J. M. W. Turner, one showing her at the Battle of Trafalgar in 1805, the other showing her being towed to the breaker's yard in 1838. Temeraire served as a prison ship from 18121815 and as a receiving ship until 1836 when she was briefly recommissioned. She was broken up in 1838, and some of her timbers were used to build a communion table and two bishop's chairs in St. Mary's Church, Rotherhithe. HMS Phoebe was a 36-gun fifth-rate frigate of the British Royal Navy. She was launched in 1795 at Deptford on the Thames. During the initial stages of her career, Phoebe saw active service in the Mediterranean, capturing the French 36-gun Nereide in 1797. On 19 February 1801 she encountered the French 40-gun L'Africaine, which was intending to transport 400 troops as reinforcements for a French invasion force in Egypt. L'Africaine surrendered to the Phoebe after sustaining heavy casualties. The Phoebe was involved in the Battle of Trafalgar in 1805, commanded by Captain The Hon. Thomas Bladen Capel. She saw further service after Trafalgar, including in the Pacific and the War of 1812 against the United States. While operating in the Pacific against American ships, Phoebe, in company with the sloop-of-war Cherub, under the command of Captain James Hillyar who had orders to capture the USS Essex "at all costs", captured the 36-gun USS Essex in Valparaíso on 28 March 1814. Phoebe became a hulk in 1826 and was sold for breaking up in 1841. James Martin wrote a fascinating account of his experiences at the Battle of Trafalgar. A transcript of it is shown here. We are hoping to find out a little of the lives of each of those named, especially any descendants of those listed. 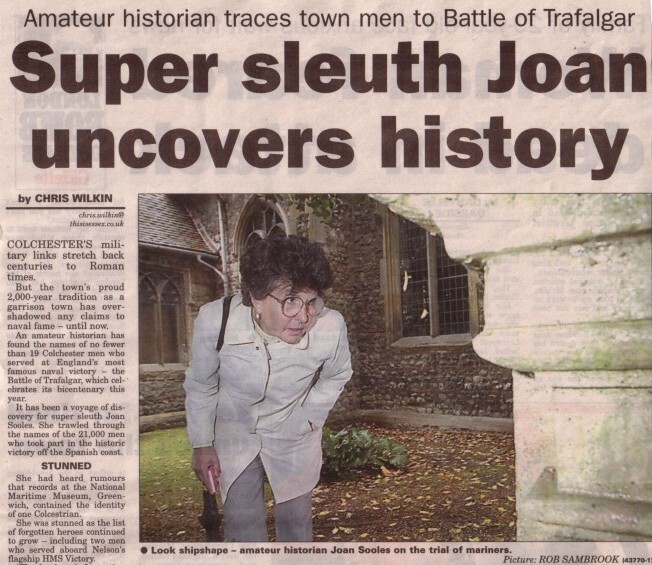 Joan Soole may be contacted by telephone at 01206 657840 in UK or 0044 1206 657840 overseas or email. If you can help with additional information, please contact Joan directly or through this website by email. The English fleet consisted of 27 ships, 4 frigates, and 2 small craft under Vice-Admiral Lord Nelson with his flag in Victory. The Franco-Spanish fleet consisted of 33 ships, 5 frigates, and 2 small craft under Vice-Admiral Villeneuve and Admiral Don Frederico Gravina. At daybreak the enemy were discovered 11 miles to leeward. The British fleet stood down to the attack in two lines, and the French opened fire on the leader of the lee line at noon. At 12.10 Vice-Admiral Cuthbert Collingwood broke the enemys line and at 1p.m. Lord Nelson did the same. As soon as the light wind permitted, the remaining British ships came up and engaged, and by 1.30 the battle was at its height. At 1.25p.m. Lord Nelson was mortally wounded while walking the Victorys quarter-deck with his flag-captain, and by 3p.m. the firing had diminished. At 4.40p.m. Having learned of the completeness victory, the British Commander-in-Chief quietly and without a struggle ceased to breathe. By 5p.m. the fight was over, the fleet being 8 miles N.W. by W. of Trafalgar. The British lost 449 killed, which included Vice-Admiral Lord Nelson, 2 captains, and 34 officers; and 1241 wounded which included 106 officers. The British ships suffered severely in the hulls, and many were wholly or partially dismasted. The Franco-Spaniards lost 18 ships captured, of which 1 blew up. It appears that the enemy lost about 7000 killed and wounded, which included two admirals and seven captains killed. The remainder of the allied fleet managed to escape, and six months afterwards the French commander-in-Chief, Vice-Admiral Villeneuve, died at Rennes (it is said by his own hands), and was buried without military honours. Of the 17 prizes 2 sank, 6 were wrecked and lost in a storm after the battle, 2 were burned, and 1 was destroyed. One of the most decisive battles in the history of the Royal Navy, Nelson's defeat of the French fleet took place on 21st October 1805 off Cape Trafalgar and was conducted with not a single British ship lost, although few ships escaped severe punishment. Loss of life on both sides was tragically high. The British fleet were. HMS Victory, HMS Britannia, Temeraire, Neptune, Conqueror, Leviathan, Ajax, Orion, Minotaur, Spartiate, Agamemnon, Africa, Royal Sovereign, Prince of Wales, Dreadnaught, Tonnant, Mars, Polyphemus, Belle Isle, Bellerophon, Colossus, Defiance, Achilles, Revenge, Swiftsure, Defence, Thunderer. 27 ships. (Supported by the frigates HMS Phoebe and HMS Naiad). If you can help with additional information, please contact us by email. From which much of the above information has been taken.